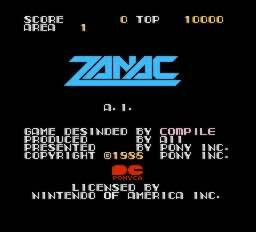 Zanac original NES Nintendo Game cartridge only - Cleaned Tested and Guaranteed to Work! I was one of tose who unfortunately never got his paws on a copy of this game at the time it was actually released. I missed something great. Fortunately I bought a copy much later for my still-working NES, an actual, physical cartridge and not an emulated ROM. The game is your basic space shooter, but a Space Invaders clone it definitely isn't. The story is that te universe is governed? by a gigantic computer system called, strangely enough, the System, that has basically evolved into a living being over millions if not billions of years. To those who opened the icon properly, the System could be a vast store of benefitial knowledge. But if the icon was opened improperly, the system would bring ruin to those who tampered with it. The day came when umanity attempted to tap into the System's knowledge and power and, whether maliciously or simply due to ignorance, opened the icon improperly. The syste of course activated and sent its forces against Earth. Then the proper method for opening the icon was finally discovered, but though the Icon sent the signal to the System to abort its current operation, the computer did not respond. After many failed attempts to fight the System's vast firepower with equally vast forces, it was determined that a single small but extremely powerful craft might have a better chance of penetrating the System's formidable defenses which, like Darth Vader's Death Star, were designed to repell large-scale assaults and not for attacks by single foes. 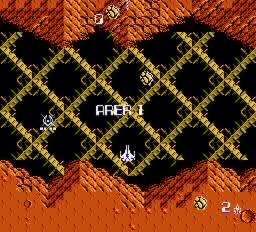 The gameplay is pretty unique for its time since the difficulty depends largely, though not entirely, on how aggressively you, the player, fight. 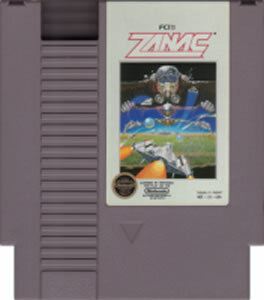 Even so, this is still one of the most difficult games on the NES. 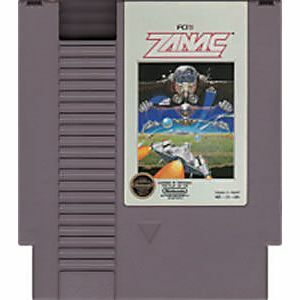 This is offset, however, by the fact that the game features one of the most awesome soundtracks the NES ever produced. This might surprise some considering the fact that if memory it came out fairly early in the NES' lifetime. The music isn't very varied but it doesn't have to be since every tune will get pleasantly stuck in your head. You'll even hear one or two tunes and even more sound effects that are featured in Zanac's presumed "sequel" The Guardian Legend. 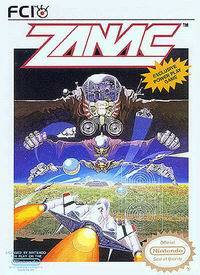 In short I wholeheartedly recommend this game to anyone wo owns a NES. Be warned though, this game's difficulty level is definitely not for the casual gamer.